I have been wanting to try Hakka food ever since my brother-in-law explained the concept to me about two years ago. From his description it something of a blend of Chinese and Indian foods. According to online sources it is Chinese preparation with Indian flavours. Needless to say I was intrigued and salivating. So when a friend of a friend suggested we go to a Hakka Bar in the west end, I was ridiculously excited. Unfortunately, due to the wine beforehand, the free whisky shots during and the beers afterwards, I am ashamed to tell you I can’t actually confirm the restaurants name or location, but I kinda think the mystery adds to the adventure. As a group we ordered 5 dishes to share and I sampled the two that were vegetarian. And let me tell you they were absolutely delicious! 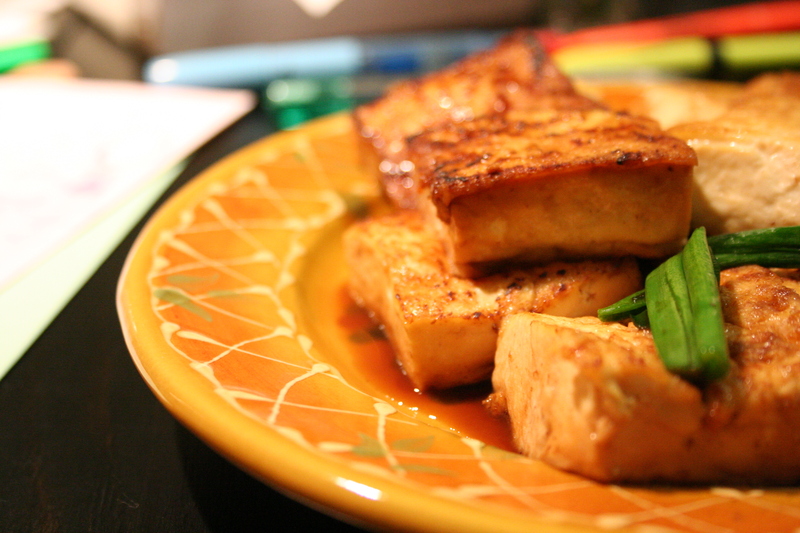 The first was an appetizer of sorts that consisted of spicy, salty fried tofu cubes served with homemade BBQ sauce. It came out piping hot, fried perfectly, and with just the right amount of spice. The second was a soup made of thick coconut curry sauce, rice noodles and a mix of vegetables. It was creamy, spicy, and perfectly satisfying. I couldn’t get enough. And I couldn’t believe I had waited so long to try it. I sometimes feel that as a vegetarian, I don’t get to try new foods very often. I have had most of the common vegetarian Thai, Indian, Japanese, and North American dishes. Sometimes it can get a bit boring, although perhaps it is my fault that I don’t venture outside of my comfort zone enough. And while the two Hakka dishes I tried were truly delicious, I felt like I was missing out by not trying the others. The experience got me thinking about my choice to be vegetarian. I have been making that daily choice for over 15 years, which equates to more than half my life. And I suddenly realized that I have almost forgotten why. What used to be a huge part of who I was and how I defined myself has become not much more than a routine. And so this one new experience, may have launched me on a whole new adventure – becoming an omnivore. I am not sure if I will go through with it, but it is really freeing to think that I could. It is exciting to think that maybe one day I will try fish and chips at a seaside port in England, or sample paella in Spain, or enjoy a pint and a bratwurst in Germany. I know that these regional cuisines choices are stereotypical but for me that’s the point. Food is a huge part of cultural identity and everyday life. I don’t want to miss out on experiencing this diversity simply because I am vegetarian. I want to try it all, experience it all, taste it all. Today I say yes to delicious food. To pushing the boundaries of my comfort zone. To embracing the experience of travel whole-heartedly. To making decisions that are best for me, here and now. This entry was posted in 50 Firsts, 50 Foods, Future Planning, Ponderings. Bookmark the permalink.